Mosaic Maker: With her drumming, the recordings she produces, and her collaborations, TLC is creating historic arrangements. 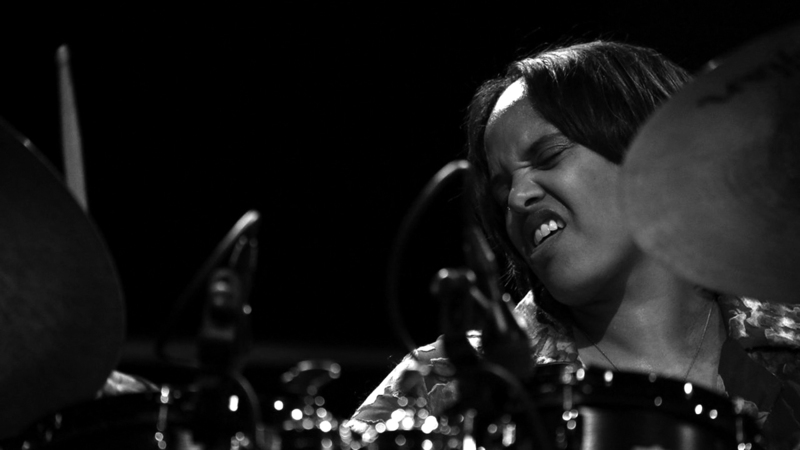 In the Terri Lynn Carrington chapter of Jazzwoman, Conversations with Twenty-one Musicians, she is described as a "polystylist drummer whose eclectic background is particularly suited to fusing jazz traditions with contemporary popular music." The polystylism and wide-ranging interests are the natural result of a life lived in music. Her mother had studied piano and her father was a professional saxophonist. Her grandfather had drummed for Fats Waller and others, but died in 1965, the same year Terri Lyne was born, following a session with saxophonist Gene Ammons. His granddaughter still had her baby teeth when she began playing saxophone, but when they came out and she was unable to work the mouthpiece, her father, Solomon Matthew ("Sonny") Carrington III, gave her grandfather Matt's drum kit. As if the old man's spirit came with it, within a year or so Terri Lyne was declared a prodigy. At 10 she played a jazz festival with trumpeter Clark Terry. A year later she had a chance to drum with Dizzy Gillespie and Buddy Rich. That year she also became the youngest student to receive a scholarship to Berklee College of Music. She later attended the school, but left after a year and a half to move to New York, where drummer Jack DeJohnette became her mentor. By her early twenties, Carrington was in great demand by top artists for concerts and recordings, releasing her own debut in 1989. It was a borderless snapshot of her profound instrumental talents as well as songwriting and arranging, capturing that natural eclecticism that hears greater unity than others – especially record company execs. In fact, her label shelved her second effort. "I think it was because it was all over the place," she said in this June 2013 interview. "I would have preferred they put it out. I'm still a little all over the place, but I try to make it have some kind of cohesive that makes sense for other people." After some broad exposure first as house drummer on "The Arsenio Hall Show" and then the same role on Quincy Jones' "Vibe," her reputation was largely as a musician's musician until her groundbreaking Mosaic CD won her second Grammy Award® two years ago. That project, a gathering of female instrumentalists and vocalists performing compositions by women, was followed by the Grammy-nominated Money Jungle: Provocative in Blue. It is an exploration of Duke Ellington's 1963 Money Jungle, a collaboration with bassist Charles Mingus and drummer Max Roach. Carrington's trio included pianist Gerald Clayton and bassist Christian McBride. To promote the Segerstrom Center's October 25-26, 2013 concerts by the collaborative trio ACS, which stands for pianist Geri Allen, Carrington, and bassist/vocalist Esperanza Spalding, Cristofer Gross was assigned two articles on the band and interviewed Carrington by phone from her home in Boston. Click to read the Segerstrom Center 'Revue' story on ACS. THEATERTIMES (Cristofer Gross) I heard how you met Geri Allen at Howard University and met Esperanza Spalding at Berklee. Was Spalding still a student? TERRI LYNN CARRINGTON I came in July, so she had just graduated, and was about to start teaching. THEATERTIMES Yeah, they made her a professor immediately upon graduating. Had you heard of her? CARRINGTON Not really. The [Berklee] president had given me a CD of a project that Pat Metheny produced at Berklee with students. She played on that, with Christian Scott and some other people. I had a show to do locally shortly after I met her, and I asked her to join me and Adam Rogers and Seamus Blake from New York and she played bass. And it was great. She was reading these crazy baselines. I was really impressed. THEATERTIMES She and Geri were part of a quartet you took to Israel shortly after that? CARRINGTON The quartet was Geri, Esperanza, and Tineke Postma. THEATERTIMES That stands as the first time that all the ACS members played together. CARRINGTON Yes. And then I used that quartet as the foundation for the Mosaic project. That gig was in August 2008, and I probably started right in with Mosaic the following spring. THEATERTIMES I saw the set list for the tour, and recall you said in an NPR interview that you're primarily digging into standards. What about standards, and the tunes in the tour book, appeal to you? CARRINGTON Some are Wayne Shorter pieces that may not be considered standards. I contributed "Masqualero" and "Fall." "Masqualero" is a very open format and, if possible, I like to start a set with it because it kind of leaves our minds free for a minute and we're not immediately trying to work through some changes, you know. You're able to just be creative right away and it sets a nice tone for the rest of the evening. But this year we're also doing shows along with Wayne, and with Dave Douglas and Joe Lovano's group. Because it's a triple bill you can only play 45 or 50 minutes and so [she laughs] we're going to stack it with Wayne Shorter music. I also brought "All Of You." I like playing that. Espy brought an Eric Dolphy tune called "Miss Ann," and "Nothing Like You," the one that Bob Dorough did with Miles Davis. It's just very fun. We do "If I Were A Bell." We do one original we love, a song of Geri Allen's called "Unconditional Love" that is on my CD. And I even rearranged that another time, [laughs] sounds totally different. And I've rearranged it for another CD that I'm working on for Dianne Reeves, so there's yet another version of the song coming out. So, yeah, it's a nice repertoire. THEATERTIMES Do you plan to record any shows? CARRINGTON Our very first gig in New York was at the Vanguard and we recorded a couple of those nights and I think it sounds good, but I don't know what we'll do with it. We don't have any plans to release that or to go into the studio. I don't think we'll record this coming tour or anything. But you never know what will happen. We're all incredibly busy and come together when we can and that's the beauty about playing standards: they can sound fresh and different every time. And we can change the repertoire up easily and the way Esperanza described it once is perfect: when you play standards it's like a bunch of artists painting a fruit bowl and they're all different. THEATERTIMES So which artist are you? I suppose Esperanza might be Pizzicasso. CARRINGTON No, no, I don't really see a difference as long as the musicianship is strong. I think as long as you play with strong musicians, whether it's a trio or quartet or quintet . . . It's just like, whenever I'm playing quintet, and it comes time for the piano solo, I'm just as excited and musically challenged as I am when it's a horn solo. It just happens that I hadn't done a lot of trio stuff. But, you know one of my favorite groups is the Keith Jarrett trio, so . . .
THEATERTIMES Well, a drummer's always on, anyway, right? A lot of times in a group, the soloist still has the drummer accompanying, while the horns or bass walk off to the side. CARRINGTON Yeah, we don't have those breaks. [laughs]. THEATERTIMES Was Real Life Story the first album you released? CARRINGTON Yes. I covered "Blackbird" and a Patrice Rushen song called "Shhh. " THEATERTIMES Those were the exceptions, the rest of the album and in fact the overwhelming majority of the songs you've recorded on your own releases, were written by you. Some might find it unusual for a drummer to be such a prolific songwriter. CARRINGTON I think you basically hear music in your head. Either you hear strong melodies or you don't. I don't think you even have to have formal training. But I did study piano at Berklee starting at age 11 or so. And I took arranging classes and composition classes when I went there full time for a few semesters. And once you learn the basics it's just up to you, your creativity. THEATERTIMES I heard you quote a Japanese phrase somewhere that Wayne Shorter uses. It means "Many in body, one in spirit." THEATERTIMES It reminds me of something actor Nathan Lane explained to Charlie Rose about how it feels when a large cast stage musical is really working, that it all seems to be coming from one mind; one voice seems to be speaking. It's greater than the sum of the parts. And in interviews, I've heard you indicate that one of those parts is the audience, which sometimes gets left behind. CARRINGTON Yeah, exactly. Can't forget about the audience. [A little laugh.] I think in the end it's all about a balance and the older we get the more we realize that. Sure a lot of us want to be purists, and pure to our art and our artistic ideas. If that's the case then make the art and stay in your house with it. But I think there's a thing, with balance that has to be acknowledged. THEATERTIMES So let's talk about Money Jungle. You were thinking about it for some time? CARRINGTON Yeah, it's 12 years since I first heard the record and, then, I briefly thought about covering some of the songs, but not the whole album. That's been in the last five years. People ask me why and I still don't have a good answer. I was just compelled to. THEATERTIMES You have connections with Roach, whom you greatly respect. THEATERTIMES You added the oral history to it. That wasn't part of the original. CARRINGTON Yeah, I think using spoken words to relay your messages can be important in jazz, since most of it is instrumental and you're leaving a lot to interpretation. But sometimes you add just a few words, 'cause there's not a whole lot of spoken word on Money Jungle, and your intention becomes clearer. THEATERTIMES It's amazing how Dr. King's words cut right to the point: "The many give up necessities so the few can have luxuries." You don't need more than that. They should put that on the penny so everybody remembers what the hell's going on here. CARRINGTON [laughs] Good point. That's why that came first. THEATERTIMES How did you choose your speakers? Condoleezza Rice and Bush are in there. So you didn't use only liberal voices. CARRINGTON It wasn't anything partisan, it was just finding quotes on the economy. THEATERTIMES Yeah, like you said: balance. THEATERTIMES I always ask for a story or impression from anyone who had personal experience with Dizzy Gillespie. CARRINGTON I have one I reflect upon. When I was about 11 or so, I sat in with him and he asked what I wanted to play and I said "Straight, No Chaser." And he said, Oh, oh, I've forgotten how that goes. Can you sing it for me? And then he put the mic in front of me. Because I was 11, I guess he just wanted to make sure I knew it. So I started to sing the melody and he said, Okay, I remember it. He liked to be called Mr. Gillespie, so I always made sure when I had students or anyone around me meeting him, that they addressed him properly. And another great story for me was, he was playing Boston and I gave him a ride to the train station in a snowstorm because the airports were shut down. He was just trying to get back to New York. And he had these beautiful alligator boots and they'd got pretty destroyed going through the slush and the storm, but he was staying at a hotel that either was near, or had located in it a Legal Seafood [restaurant] which he loved. And he bought these two big quarts of chowder, and he was just talking about those quarts of chowder all the way, like he couldn't wait to get on the train and get home and eat it. So I took him to the train station, dropped him off, and, because he didn't want to miss his train he got out in the traffic and walked through the blizzard to the train. And then I got home, driving very carefully, and nervous that I didn't kill myself taking Dizzy to the train station and when I got home and emptied the car, the chowder was still sitting there.. I felt bad for him, but my family ate well that night. THEATERTIMES [Laughing.] Great stories. Thanks for all of this, and I really look forward to hearing you guys whenever that is [laughing] you're coming into town. CARRINGTON [Laughing] Okay, thank you. Yeah, I'm looking forward to it. Maybe I'll meet you then. THEATERTIMES I'll try and get back and say hi. Take care of yourself. CARRINGTON You, too. Good bye. Click image to shop Amazon for CDs and LPs or the Apple Music button for iTunes digital. Carrington, was born in 1965 in Medford, Massachusetts. After an extensive touring career of over 20 years with luminaries like Herbie Hancock, Wayne Shorter, Al Jarreau, Stan Getz, David Sanborn, Joe Sample, Cassandra Wilson, Clark Terry, and Dianne Reeves, she returned to her hometown and an appointment as professor at her alma mater, Berklee College of Music, where she also received an honorary doctorate in 2003. In 1983, after three years studying at Berklee under full scholarship, Carrington moved to New York and began five years working with an eclectic list of major figures like James Moody, Lester Bowie, and Pharoah Sanders. In the late ‘80s moved to L.A. to serve as house drummer for Arsenio Hall's show, a role she repeated a decade later on Quincy Jones' "VIBE."